The Watchdog | ii | Style Weekly - Richmond, VA local news, arts, and events. C. Wayne Taylor gets it on the record. Uh-oh. He&apos;s at it again. “I&apos;ve been waiting for somebody to bring this up,” the smiling man says, lingering over a Greek salad at the Crazy Greek. Reporters have learned to listen closely when C. Wayne Taylor, the Richmond city government&apos;s self-appointed ombudsman, is onto something. A few days later, Taylor, 59, asks the Virginia Coalition for Open Government&apos;s freedom-of-information council for a nonbinding opinion on whether or not City Council has been unlawful in reporting its minutes. He&apos;ll also ask for a ruling on whether council has been properly conducting closed meetings. In just a few short months, Taylor has become a major thorn in the side of City Hall, the first to warn that the city&apos;s noise ordinance was unconstitutional and that something was screwy with the city&apos;s towing contract. Taylor, who lives in the 1st District, has since built a website about Richmond government (cwaynetaylor.com/city) that covers laws, codes and procedures; in the absence of official summaries of council meetings, Taylor posts his own. The resulting law shocked him. He posted it on his website and blogged about the process. Months later, a Richmond judge eventually agreed with Taylor and other critics that the noise law was unconstitutional — a major embarrassment for City Council, which largely ignored Taylor and just about all residents&apos; input. Taylor knows a bit about how the process is supposed to work. 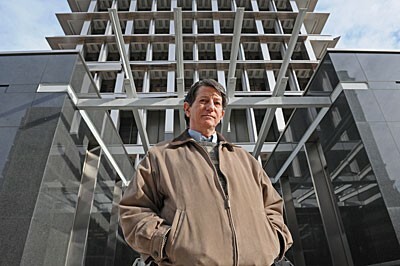 His career has traversed freely through urban planning, government and the law. The Louisa County native got his business degree from Virginia Commonwealth University and went on to win law honors at the College of William and Mary. Real-estate lawyering drove the solo practice he established in Fredericksburg after graduation; it was there that he began working with urban planners on Northern Virginia projects. “I caught the bug,” he says. Taylor filed a request for any document that granted Marshall the authority to bypass the contract. When the mayor&apos;s right-hand man didn&apos;t respond, Taylor threatened to take him to court. That&apos;s when Marshall got back to him, politely informing that no such document existed. All of this astounded Taylor. “It&apos;s like ‘Mayberry R.F.D.&apos; up there,” he says. At press time, Tyler hadn&apos;t read the council opinion that answered his questions about City Council procedures. “It would appear that [council] violated FOIA by effectively holding a closed meeting (excluding the public from hearing the discussion), but without following the proper procedure to do so,” chief counsel Alan Gernhardt writes. Questions about this opinion — which concludes that City Council isn&apos;t following the law — were left unanswered by the mayor&apos;s office, while city attorney Allen L. Jackson declines to respond, citing attorney-client privilege.